An 88% natural glue formula -- made from plants, a rapidly renewable resource. Glue stick containers are made from 25% pre-consumer recycled plastic. Works on a variety of materials. 88% natural glue formula. Made from plants, a rapidly renewable resource. 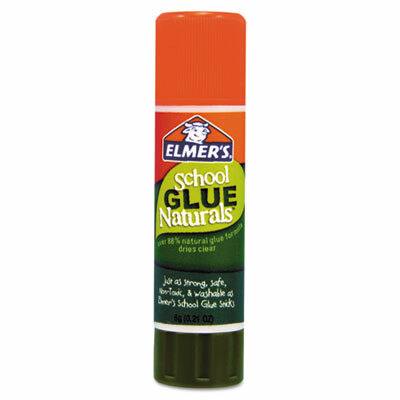 Just as safe and nontoxic as Elmer's School Glue Sticks. Glue sticks apply dry and clear. Excess glue can be cleaned with soap and water and can be washed out of clothing. Glue stick containers are made from 25% pre-consumer recycled content. Click here to see more Adhesives/Glues!